Rangers v. Devils 1/26/14, a set on Flickr. I was lucky to attend the Stadium Series game between the New York Rangers and New Jersey Devils. Here are my photos. 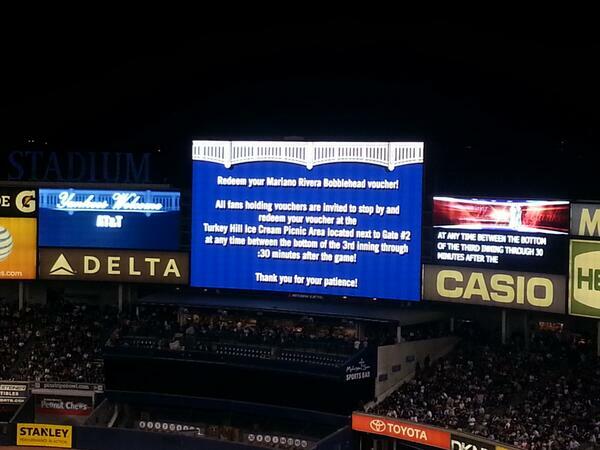 Last night, if you didn’t already know, I attended the Yankees game (I know…you’re shocked). Anyway, last night was also Mariano Rivera bobblehead night. The 4th and final bobblehead giveaway of the season. As was the case for 2 of the 3 previous giveaways, I and a few thousand of my closest friends arrived at the Stadium well before the gates were due to open at 5pm. 5pm came, they didn’t let us in. 5:10, 5:20, 5:30 nothing…still in line and no word from the team as to why we weren’t being let in. I looked on Twitter and found out that the bobbleheads were stuck in New Jersey. Long story short, at 5:45pm they finally let everyone in. However, there wasn’t a bobblehead to be found and we were given a voucher to pick up the bobblehead at a later time. As someone who has worked in the promotions department for a few teams and also ran logistics for major conferences for three years, my mind naturally began to think about how the Yankees would pull off distributing 18,000 bobbleheads during or after the game. At first I thought, set up a few areas where people can pick them up by the gates as they leave. Then it was announced: Between the bottom of the 3rd and up to 30 minutes after the game, fans with vouchers could pick up their bobbleheads by Gate 2. Wait…18 THOUSAND people to one small area? You’re kidding me right? Nope. During the 4th inning I decided to check out the situation. The line started back by the left field foul pole, down the 3rd base line, up a ramp, around the upper concourse (grandstand) and then back down. Some people waited in line for an hour and a half, missing more than half of what turned out to be a horrible game for the Yankees, in order to receive their bobbleheads. I waited in this line for about 30 minutes before getting out because I wanted to watch the game. In the 8th inning my friends and I decided to get back in line so we weren’t at the Stadium until midnight. At this point we left our seats in section 129 (which is right by Gate 2), walked down the left field line, under the bleachers and finally found the end of the line by section 112 which is just past 1st base! All in all, we were in this line for just under an hour. 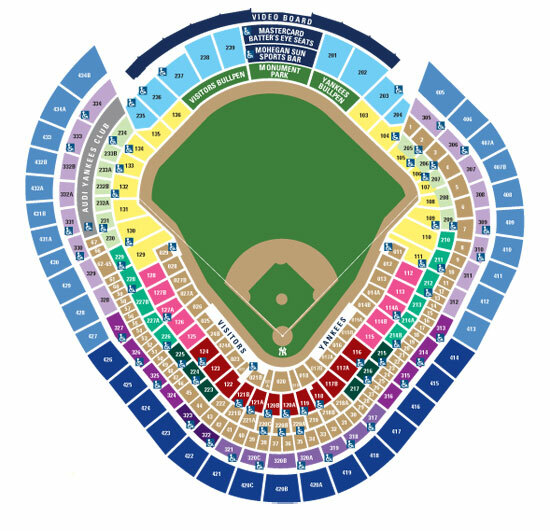 Here’s a map of Yankee Stadium to give you an idea of what I’m talking about above. Also, there were only a handful of Yankees employees handing out the bobbleheads and I won’t even get into how rude some of the staff were to fans. I’m sure you’ve read about that somewhere else. 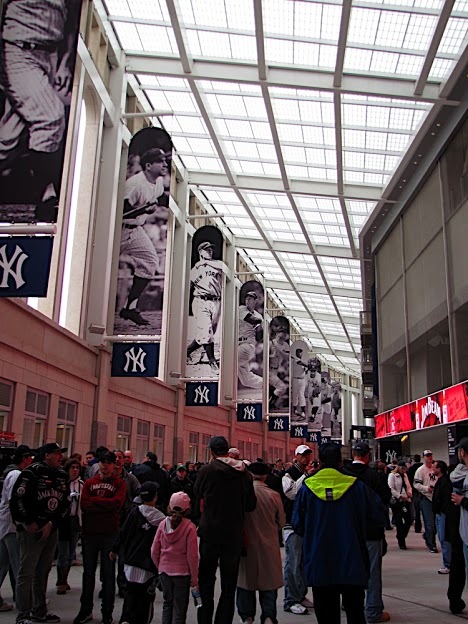 There’s an area in Yankee Stadium called “The Great Hall” where most fans enter/leave the Stadium through (which is also Gate 6). Since it seemed they closed off sales in the food court area because of the crowd attempting to go to Gate 2, they should have closed off the Great Hall to anyone who did not have a voucher and then set up the hall like a redemption center. There’s three other gates and multiple areas for fans to leave from (except for fans that needed to use elevators to exit). Why didn’t the team set up tables and use the Great Hall? We’ll never know, but that’s what I would have done if I was running the show over there. 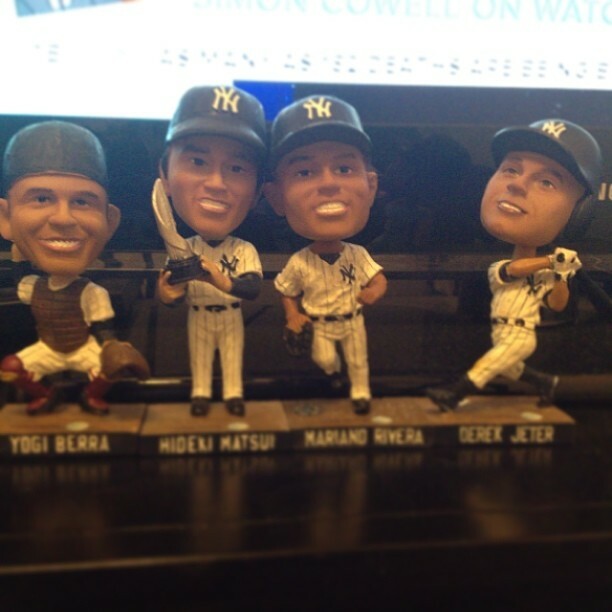 Well, after a horrible game, and a nightmare of an experience, I have my Mariano Rivera bobblehead and he has now joined his friends, Yogi Berra, Derek Jeter and Hideki Matsui in my apartment. UPDATE: Late this afternoon the Yankees sent out a press release announcing that anyone with with tickets for last night’s game will be able to redeem them for any regular season game next season (aside from Opening Day and Old Timers’ Day). Also in the press release was information on how people with bobblehead vouchers can still get a bobblehead. I am happy that the Yankees are doing what they can to make good on the mess that was last night. Only wish they gave us the bobblehead option last night too. I am going to the game tomorrow and would have rather just walked up and redeemed my voucher then without dealing with the headache of last night. Also, I can only assume that the majority of fans that were at last night’s game are not on social media, not a season ticket holder or know to check the press release section of the Yankees website and will never know about these options. On July 5th I received a call from my mom — my 96-year-old Grandma Elsie had taken a turn for the worse. It was just a matter of time before she would be gone. I was so thankful that I was with my friend Megan when I received that call. Having someone around made receiving the news a little easier. 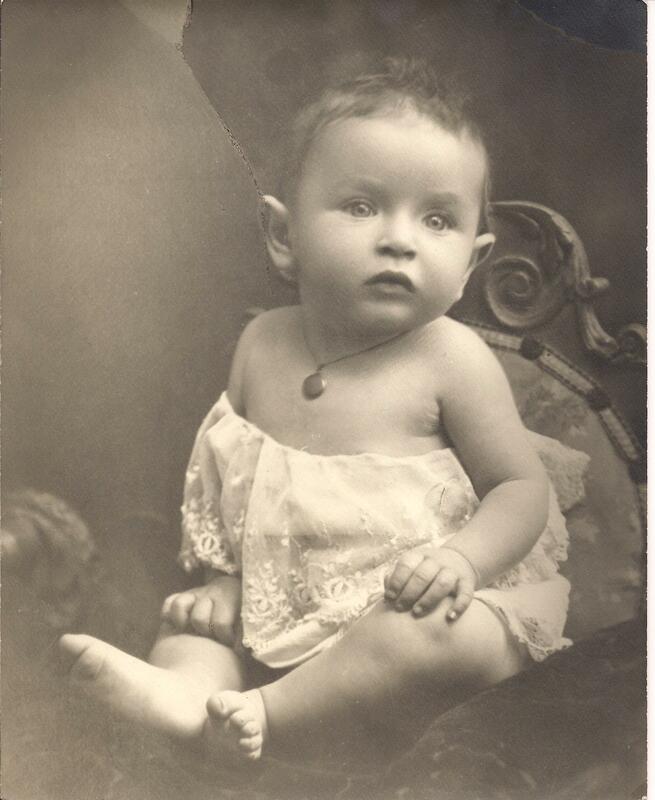 Grandma Elsie as a baby. How precious is this photo? That next day, while on the subway, I decided that when the time did come I wanted to speak at my grandma’s funeral. My grandma and I had a very special relationship. I knew it was my job to tell people how much she meant to me, especially after attending a family friend’s funeral earlier that week and hearing my childhood friend speak so lovingly about his grandmother. 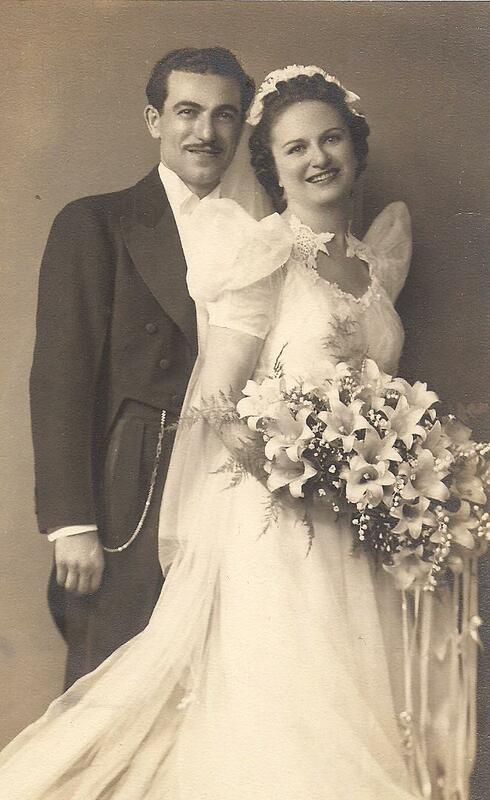 My grandparents, Jack and Elsie, on their wedding day in 1940. Shockingly — yet no surprise to anyone who knew my grandma — she held on for seven more days. 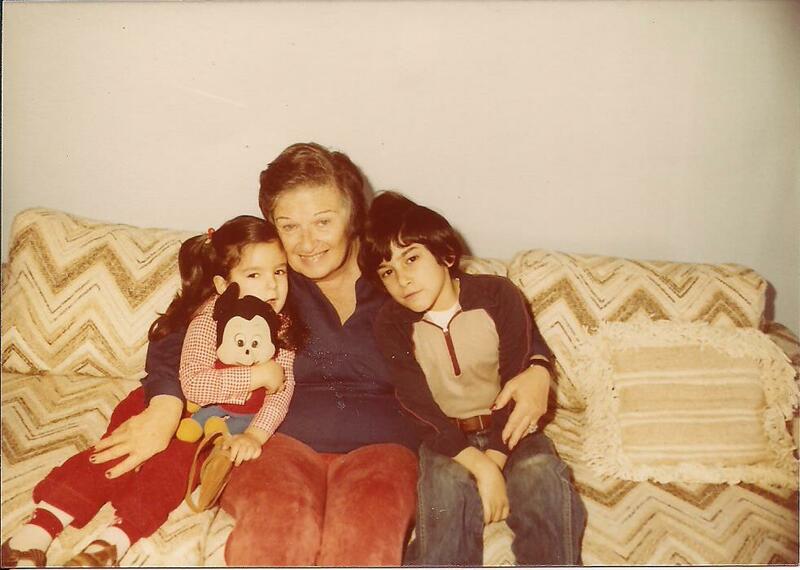 Grandma Elsie was a strong-willed woman, and passed last Thursday morning. I was so relieved to be working from home that day so I could cry and grieve, then put myself together and start making plans to fly to Florida for the funeral. Until I arrived at my parents’ house on Friday morning, I planned on speaking during the service. However, when I began to read my mom’s eulogy, couldn’t make it more than a sentence in without crying, I knew there was no way I would be able to speak in a few hours in front of friends and family. Of course I was right; I hardly kept it together. Instead of speaking, I’m putting my words on “paper” so everyone can know how much I love my Grandma Elsie and just how much I will miss her. 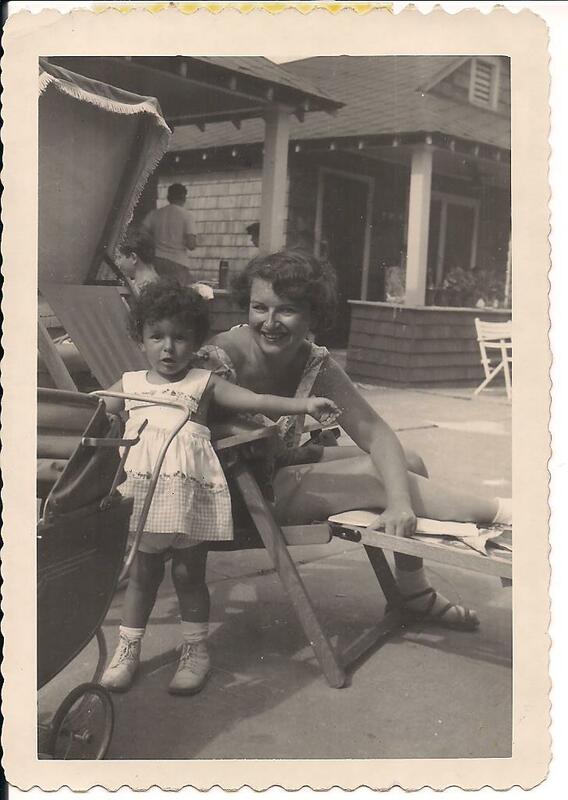 My grandma and I had a special relationship that started when I was a newborn. You see, if you didn’t already know, she called me “my baby.” Even well into my 30’s she STILL called me her baby. She loved to tell people how she brought me home from the hospital at only a few days old. Of course my parents actually brought me home from the hospital, but in her eyes, she brought me home. I was, after all, the first granddaughter….well, after the dog. She’d tell this to anyone who would listen that I was her baby. In fact, in 2010 she broke her hip and was in a rehab facility for a while after surgery. 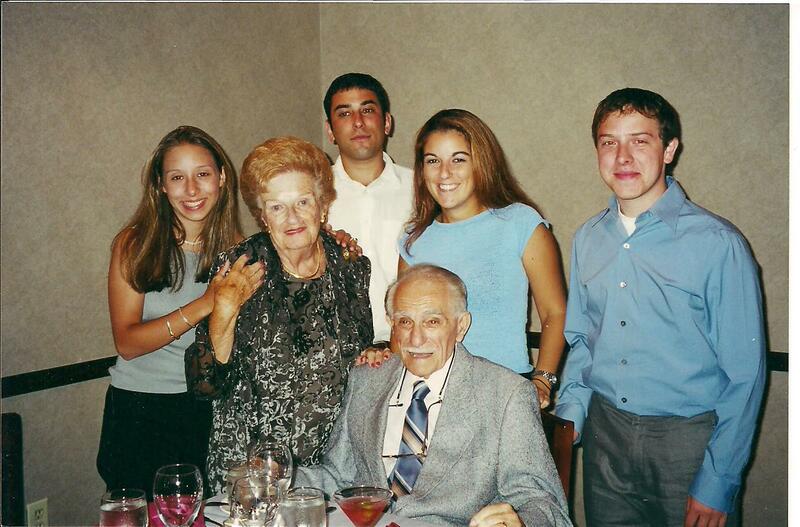 I was in Florida for Rosh Hashanah and my parents and I would visit grandma. Nurses and staff would walk into the room and she would stop them and say “Have you met my baby, Stefanie?” As I said, I was in my 30’s at this point already. Gotta love grandmas, right? I would always spend time with just my Grandma Elsie either when my grandparents would visit us in New York, or we were down visiting Florida. When I was 13, we moved to Florida and we became even closer. We would talk on the phone more, and occasionally go out to lunch. Once I obtained my drivers licence, I would spend time with my grandma — and my grandpa too, just because. When my grandpa passed, my grandma was in a rehab facility due to a back injury. I sat with her all day while my parents took care of the funeral arrangements. I will never forget the sadness on her face that day; my grandparents had just celebrated their 60th anniversary a few months prior. My grandma was a good cook, but she was an amazing baker. My mom and I got our love of baking from Grandma Elsie. When I was younger and away at camp she would send me coffee tins full of her famous chocolate chip cookies. When camp stopped allowing food packages, my bunkmates were devastated they get to snack on these treats. Everyone who had the privilege to try these cookies knows how delicious they were. You always knew they were made with love. Now mom and I make them on a regular basis. For most of my friends, and especially my cousin Allison and my uncle, they are my go-to for birthday presents or study supplements like when Allison was studying for the bar exam. As a little girl I remember always helping grandma roll the dough for her apple pie crust for Rosh Hashanah. However, I’ll always regret not learning from her how to make her amazing rugelach. 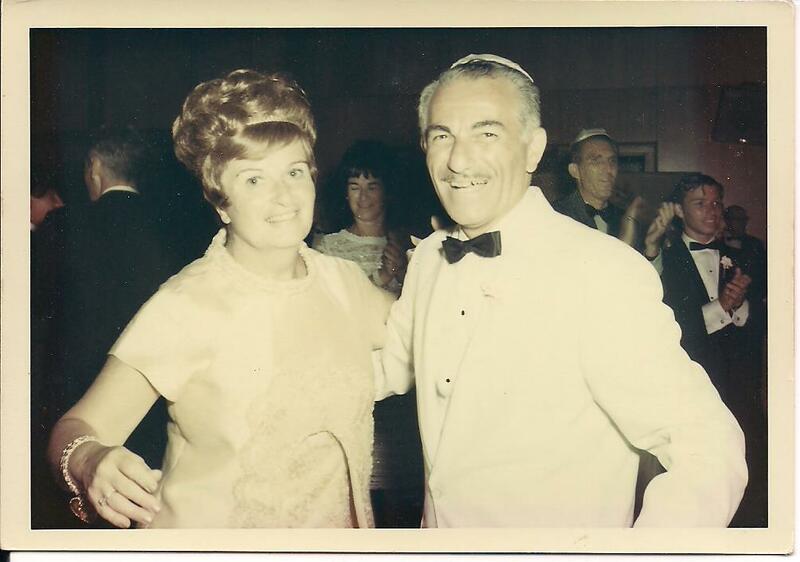 Seriously, you will never taste rugelach as wonderful as the rugelach my Grandma Elsie made. 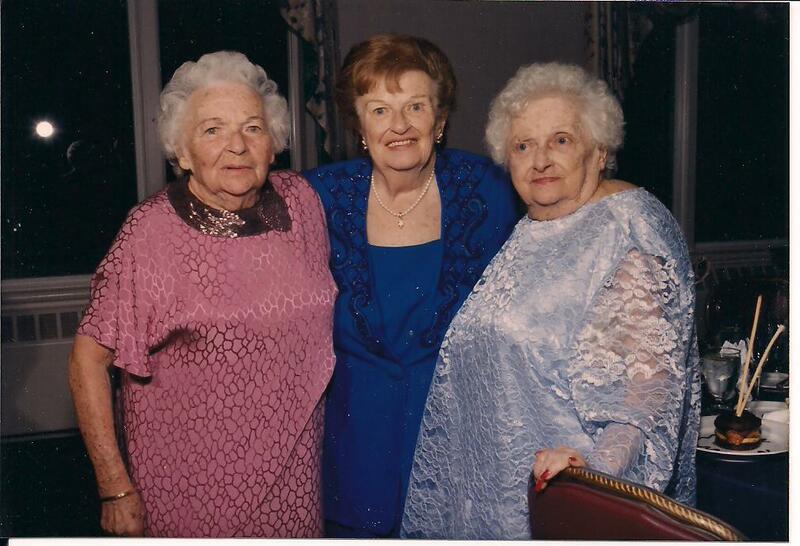 My grandma was the youngest of three strong and feisty sisters. Mae (L) and Ida (R) at my cousin’s Bat Mitzvah. She would always ask how my friends were, even if she had only met them once or just heard me talk about them. She loved meeting her grandchildren’s friends, and usually feeding them as well. This photo was taken as we celebrated my grandpa’s 90th birthday and my grandparents 60th anniversary. My grandparents are surrounded by their 4 grandchildren. The last time I spent time with Grandma Elsie she took me by the hand and said — out of the blue, “You know, I’ve decided something. 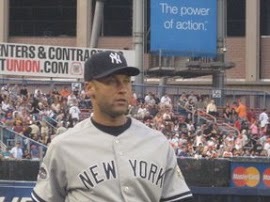 It’s ok if you marry Derek Jeter.” This of course, shocked my parents and myself into hysterical laughter. You see, she always acknowledged my affinity for the Yankees’ shortstop and captain, but told me I couldn’t marry him because he wasn’t Jewish. (I also think she just wanted me to finally get married, even if the guy wasn’t Jewish.) Well, Grandma…I hope you’re happy with how the rest of my life is turning out, and don’t worry, mom is really good at giving me guilt about still being single. My grandparents were married 60 years. 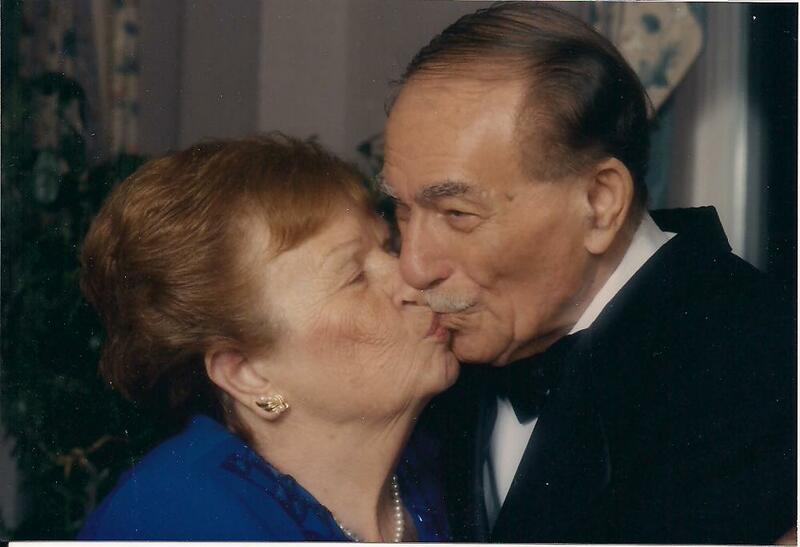 We should all be so lucky to have the love they had. Over the past few years dementia set in and it became tough to see her. After seeing my grandfathers soon before they passed, I knew that the lasting memory I wanted to have of my Grandma Elsie was a happy one where she remembered her family. So in reality she has been gone from us for a while. I, and the rest of my family, already miss her terribly. Whenever I bake — especially her famous chocolate chip cookies — I will think of my grandma, the love she had for her friends and family, and I will smile. 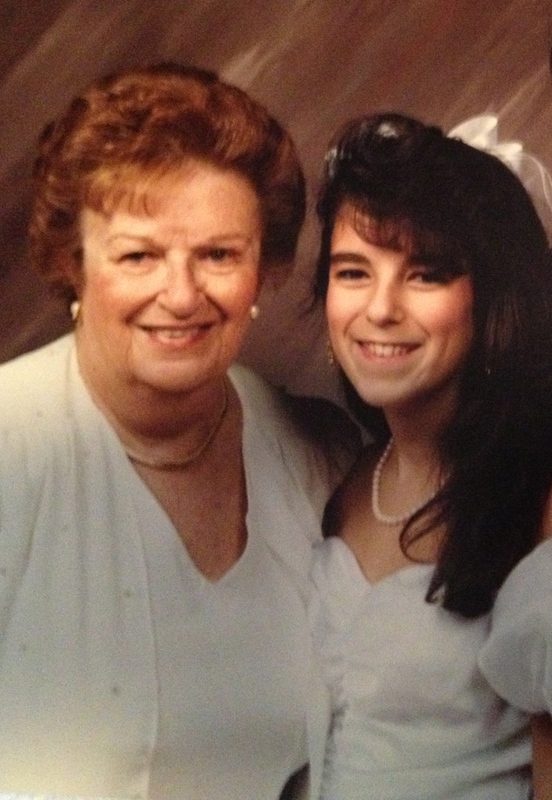 Grandma and me at my Bat Mitzvah.